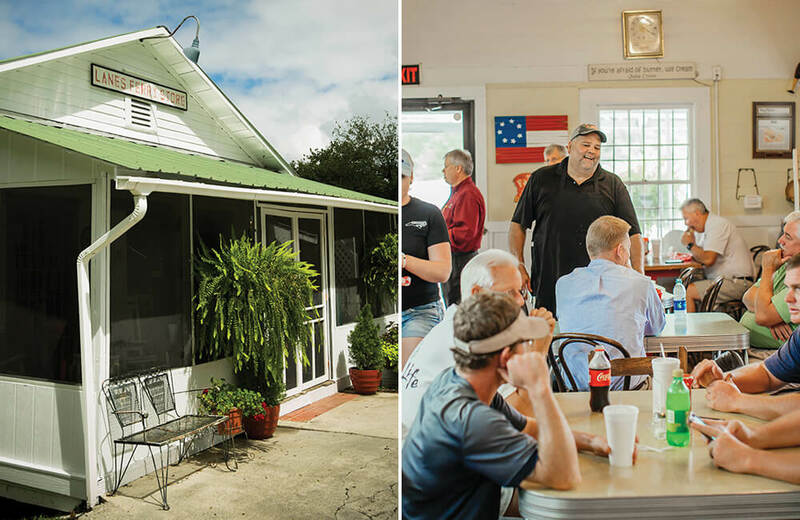 Regulars swear by this throwback diner near the Cape Fear River in Pender County, where everything — from waffles to burgers to fried bologna — is made to order and just right. At Lanes Ferry Dock & Grill, the sign beside the front door reads, “Tues-Sat Breakfast 6:30-10:30. Lunch 11:00-2:30,” but it doesn’t matter. At 5:25 a.m., Tuesday through Saturday, Kenny McManus — chef, owner, and master of the line — stops prep, washes his hands, unlocks the door, washes his hands again, and goes back to prep. At 5:30, the door opens and in comes the first customer, an hour before opening. McManus cracks a pair of eggs onto the griddle, drops bread into the toaster, and pulls out a clean plate. Mr. 5:30 gets a cup of coffee and settles in. They exchange few words besides a couple of “mornin’s,” but when the eggs are just right, McManus slips them onto the plate and delivers breakfast to the table. Back at the grill, he does a quick wipe-down, glances at the clock — 5:39 — and cracks two more eggs into a bowl. At 5:41 he beats the eggs, drops bread into the toaster, and waits. The door opens at 5:45, and the second customer arrives. His plate hits the table four minutes later. McManus repeats this a few more times, dancing a sort of waltz between two partners until 6:30 comes. Then, “grits sandwich,” another on-the-dot regular, arrives. Now, three customers deep, Lanes Ferry is open for business. By lunchtime, Lanes Ferry is buzzing. A blizzard of salt and pepper falls on each hamburger patty the moment it hits the flattop griddle. McManus drops a generous pinch of seasoning on the next patty and the next. He never measures, yet everything comes out just right. His spatula chimes against the griddle as he flips burgers. The sound mingles with the Allman Brothers song on the radio and the melody of conversation in the full dining room. Outside, Lanes Ferry is calm, quaint. The Northeast Cape Fear River flows by some 200 yards distant, and there, at the small dock and boat launch, there’s no sound except songbirds and wind, the quiet shush of water against pilings, the occasional car on the bridge. Used to be, a ferry was the only crossing — hence the name. Since as early as 1881, there’s been a store here; the current building, constructed in 1932, started as a general store. Now it’s an unassuming restaurant with a loyal cadre of diners and what might just be the best burger for 30 miles. The question comes at a lull in the room’s conversation, and the white-haired woman’s voice fills the void. “Let me check, darlin’, but I’m sure he will,” says McManus’s wife, Marie, often the sole server, hostess, and cashier. She does everything except cook. Before Marie can walk the six steps to the kitchen to ask, McManus has fished out a container of batter and stands ready to make a waffle. A trio of burgers sizzle on the grill behind him. “You want that waffle crispy, right?” he asks. Regulars. The lifeblood of Lanes Ferry. Lunch crowd or breakfast crew, McManus knows his regulars. Knows their cars, their orders, where they sit, and when they come in. There aren’t many places like this left. Some would call Lanes Ferry a throwback, or point to the fact that this building’s been here since 1932, as if longevity alone is a marker of success. But the truth is, that success lies in the food and the people behind it. It’s simple food done right and done fast. The building’s just part of it. Inside, the wooden floor is worn in places, trod ghost-pale from 85 years of use. The walls are shiplap, from a time before shiplap was trendy. But it’s not all 1930s-chic. Somehow the interior is a timeline, with old paths grooved into the floor at one end, and a customer Instagramming a perfect fried bologna sandwich at the other. Between, a vintage Pepsi sign; Formica-topped tables; mismatched chairs with ladder backs or saber legs or mid-century lines; chrome barstools. Everything here points to the idea of time, even the food. There is no break in the action. McManus — tall and broad — stands on the line in front of the griddle, his head nearly brushing the hood. He’s flanked by line cooks, and they’re pressed for room to work. 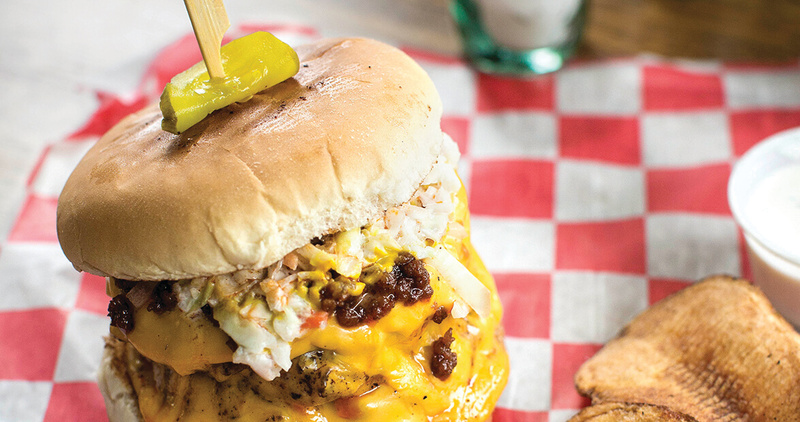 Nonetheless the trio stands shoulder to shoulder, flipping burgers, melting cheese, spot-cleaning the grill, pirouetting to stack a bun high with lettuce, pickles, and a generous slather of mayo. When one turns to deliver a burger to its bun, the remaining two close ranks. On the call “order up!” they shift, and the third resumes his position on the line. It’s an effortless and elegant dance, a result of practice and familiarity. They push out cheeseburgers wrapped in wax paper for a pair of road-crew workers, who pay and leave with a heavy lunch bag. There are two-tops and four-tops, and solo diners at the stools overlooking the line. To-go orders come in and hit the line, and just when it seems the room’s getting crowded and the cooks overwhelmed, plates and baskets fly out of the kitchen, seated diners pay and leave, and the next set takes their place. Moments of rest come, but they’re brief. McManus stretches his neck, rolls his shoulders, and talks to the nearest diner. His line cooks keep an eye on the few burgers on the griddle, then step away to grab cups hidden under the counter, and stand sipping tea and water. With a nod, McManus goes to work, preparing the next order before the front door even opens.